Have you tried the new Chobani flavors yet? I picked up some of the new banana and the new pear flavors at the store yesterday. 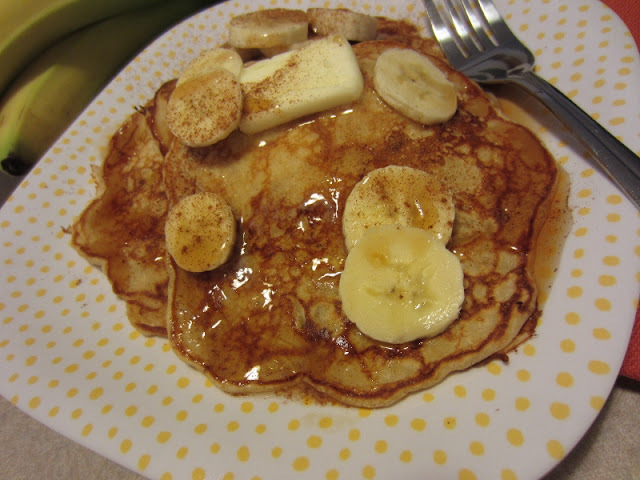 The wheels started turning and I immediately thought about making pancakes with the same flavors as banana bread: Bananas, cinnamon, nutmeg, walnuts and a touch of brown sugar. 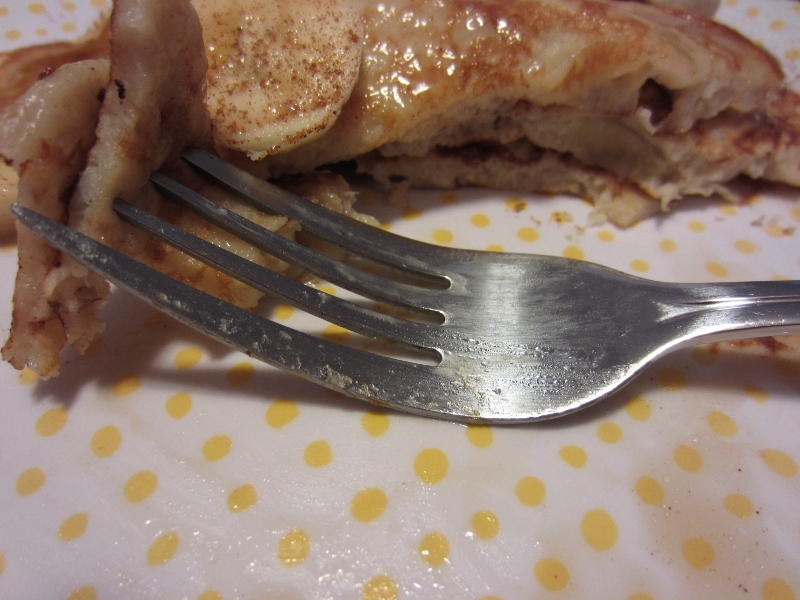 If you've never made Chobani pancakes you are in for a treat. The original recipe can be found HERE. They cook up tender and fluffy, much like buttermilk pancakes. The wonderful thing about Chobani pancakes are the ways you can get creative with the flavors. You are only limited by your imagination! Preheat your nonstick skillet. I heat until it's hot enough to bounce around a few droplets of water. If your pan isn't hot enough, the pancakes will not cook quickly enough to set up and they will get tough. DO NOT flip the cake over more than once. Only once. More flipping than that will also produce a tough pancake. 1. In large bowl, combine the flour, baking powder, baking soda, salt, cinnamon, nutmeg and brown sugar. 2. In a large glass measure (or small bowl) combine the yogurt, eggbeaters, and milk. Add the wet ingredients to the dry and mix until just combined. Fold in the banana pieces and walnuts. Allow to stand for 5 minutes. 3. Heat non-stick skillet on med heat until hot. Spray surface with cooking spray and put 1/4 cup batter onto hot pan. Cook until edges appear dry. Flip and cook on other side until done. Repeat with rest of batter. Recipe will yield approximately 8 pancakes. Garnish with more bananas and cinnamon, if desired. Yes, I know, they aren't banana nut bread, but they do have all the flavors. They are a nice breakfast treat and with all the good stuff in them, they are pretty healthy too! I love that you get almost 10 grams of protein in a serving! Not bad for pancakes. Like I said, if you like your pancakes thicker, play around with the milk. I like my batter pretty loose. That's just how I roll with pancakes, but pancakes are one of those things people are pretty picky about. Why not whip up a batch of these yummy treats this weekend? I think they would make a wonderful meal for a lazy Sunday brunch! This looks so good. I had never heard of Chobani pancakes before. I will have to try your adaptation because I like bananas and I prefer flatter pancakes, too. Great minds think alike! I made banana granola pancakes - so good, the bananas get caramelized - yum!! mmm mmm mmm! I love banana pancakes. Especially if you throw in a few chocolate chips! SO GOOD! Of course anything you make always looks delicious. I tried the apple chobani in a batter that I made as waffles and they were only just okay. I am not a fan of pancakes - wish I were but I like the crunch factor that a waffle offers. I really want pancakes now. :) Hope you are doing well Renee! !